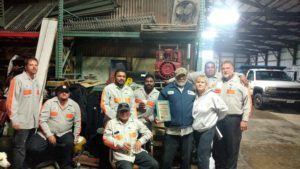 On November 18, 2016, we honored longtime employee, Jesus, with a retirement party. Donna of Sybert Landscaping presented Jesus with a plaque as a token of our appreciation for his 30+ years of service with our family business. Jesus and his son Daniel have been loyal to our family, and we wish Jesus well during his retirement. Jesus spent many years managing several lawn maintenance crews throughout the years, and he will be missed. Happy Retirement, Jesus! 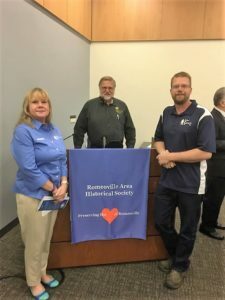 On October 1, 2016, the Romeoville Area Historical Society hosted a presentation called The History of Romeoville’s Business Boom. Sybert Landscaping was asked to be one of the six presenters. Other companies included Citgo, Lou’s Styling Place, and White Fence Farm. Sybert Landscaping’s roots lie in Romeoville, and we are grateful to be a part of their business industry. Thanks to all that attended! 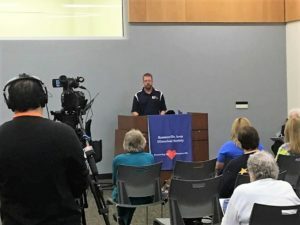 Andrew Sybert speaking about the benefits of having a family business in Romeoville, IL. All speakers answering questions from the audience. 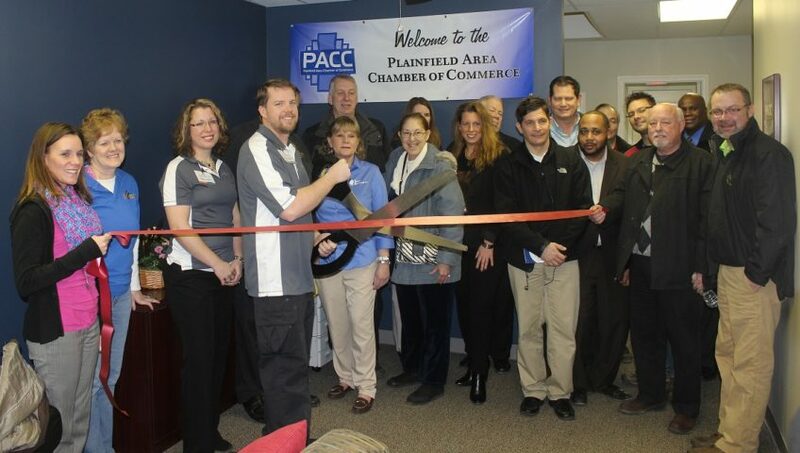 On February 11, 2016, the Plainfield Area Chamber of Commerce (PACC) hosted our Ribbon Cutting Event. 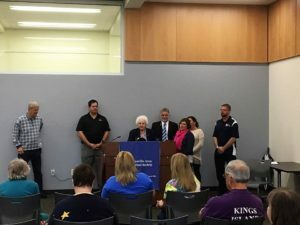 Thank you to all who showed up and supported our new membership with the PACC. We enjoyed meeting several chamber members and local business owners, and have already begun working with quite a few of them! 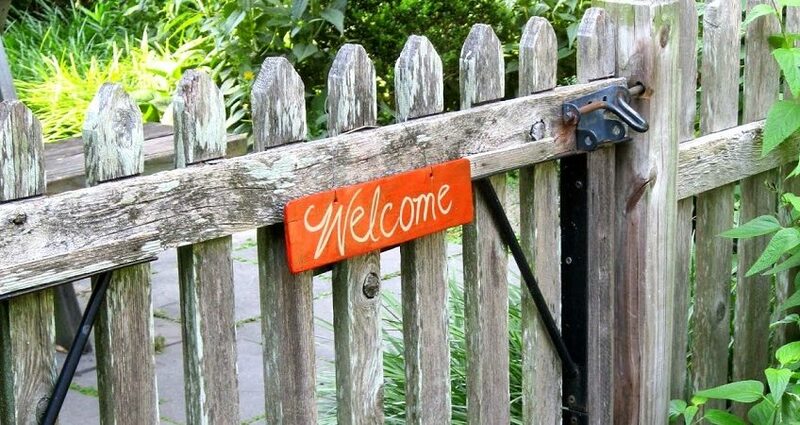 We’re looking forward to attending as many chamber events as possible, and providing members with quality services in Landscaping, Lawn Care, Pavement Maintenance, and other outdoor care needs. One of the most common questions we are asked is “do you only service commercial clients, or can you do work at my home as well?” And the answer is yes to both! The Sybert family has been servicing commercial and residential clients for over 30 years, and we always say that no project is too big or too small for us – whether you need a quick consultation on an unhealthy plant in your yard, would like mulch delivered to your home/business, or even a full redesign of your outdoor space, we are here for you! Thank you again for all who attended our Ribbon Cutting Event, and thank you to the Plainfield Chamber for your support! Thank you for visiting Sybert Group’s website! Please check back for the latest news, project updates, and gardening tips. We would love to hear from you!